Choosing the most effective, sustainable and aconomically feasible strategy to comply with the new emission limits is not an easy task. The decision must be based in part on assumptions that may or may not prove to have merit. 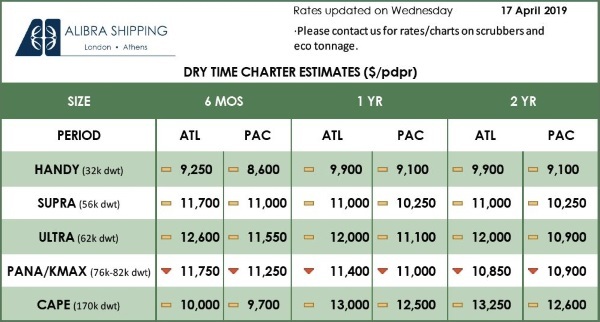 TANKER UPDATE summarizes the options and prospects. Amid the international environmental and climate-protection efforts, an impressive number of emission restrictions for shipping have come into force recently or will do so within the next few years. They are driving the search for low-emission alternatives to oil-based fuels. In particular, the decision of the International Maritime Organization (IMO) to limit the sulphur content of ship fuel from 1 January 2020 to 0.5 per cent worldwide and the recently adopted ambition to reduce GHG emissions by 50 per cent within 2050 have the potential to become game changers and have shipowners, operators and shipbuilders wondering which way to go. Currently up to 48 million tonnes of fuel with a sulphur content of 0.1 per cent or less will be then needed annually. Once the IMO sulphur cap is in force, most of the fuel consumed (70 to 88 per cent) will have a low sulphur content of 0.1 to 0.5 per cent and will take the role of the high-sulphur fuel used today. In 2016 an installed base of roughly 4,000 scrubber systems by 2020 was assumed, with no more than eleven per cent of the fuel consumed globally would be high-sulphur fuel (HFO). 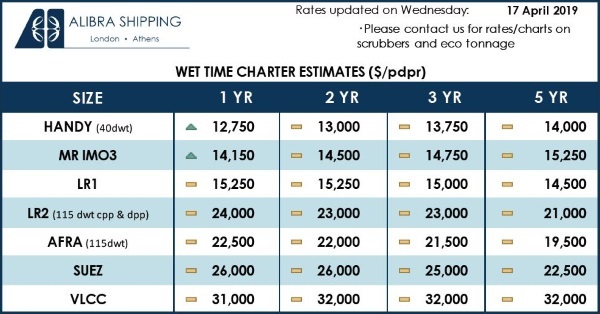 Latest estimates assume only 1,000 to 2,000 scrubber installations, which leads to a high-sulphur fuel consumption well below 10 per cent in 2020. This raises the question whether HFO will be available in many ports due to low demand, and if so, at what price. To support the Port State Control and flag states with the enforcement, the IMO at MEPC 72 agreed to establish a ban on carriage of non-compliant fuels for all ships without scrubbers. This ban is likely to be adopted at MEPC 73 and will then take effect in March 2020. Ships without scrubbers will still be allowed to carry non-compliant fuel as cargo. As per March 2018 most oil tankers fitted with a scrubber chose a hybrid option that provides the flexibility to operate in both open- and closed-loop mode. When at sea the switch can be made to open loop using only seawater. The sulphur oxides in the exhaust react with the water to form sulphuric acid. Chemicals are not required since the natural alkalinity of seawater neutralizes the acid. When required to switch to closed loop, for instance whilst entering a port in a low-alkalinity area, the natural alkalinity of seawater is boosted by an alkali which uses caustic soda (NaOH) as a buffer. 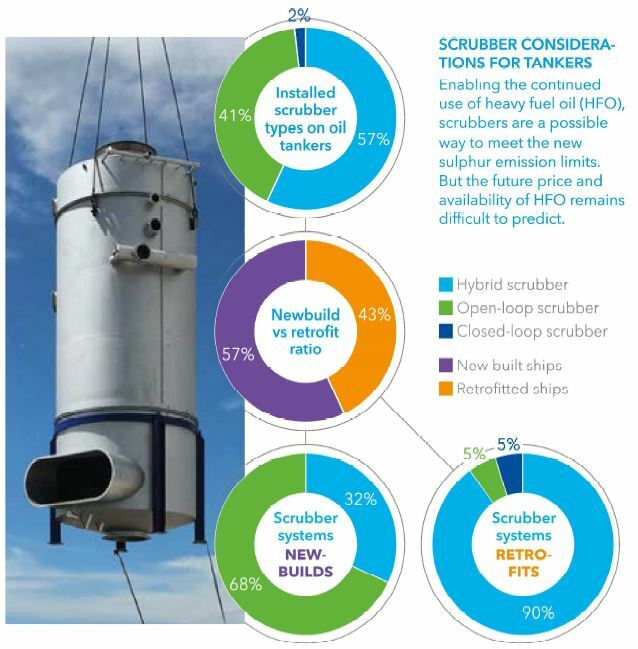 41 per cent of oil tankers using a scrubber preferred the open-loop option. Open loop scrubbers comply with the IMO’s 2020 regulations regarding SOx emissions while being simpler, cheaper and quicker to install and as such requiring less time off-hire. An open-loop scrubber has less equipment for a crew to monitor and maintain. The shipowner also does not have to worry about the purchase of sodium hydroxide (caustic soda) or more crucially, waste disposal in port. New, low-sulphur-compliant blended fuels (0.5% S) will be available in the market in 2020. It is expected that a varying range of products will be available in different parts of the world, depending on local refinery technology and crude oil quality. These fuels may prove to have a different composition than currently available HFO, hence predicting their compatibility with other fuel batches may be a challenge. It is expected that precautions with regards to fuel storage and mixing will be necessary. The ISO 8217 Fuel Standard working group is currently putting effort into selecting testing methods for fuel stability and compatibility. A draft standard should be available in autumn 2019, with the updated standard publication expected in 2022. First samples of blended fuels are expected to become available later this year, and this will allow all stakeholders to gain experience in using them. These are some of the practical challenges resulting from sulphur reduction. At the same time the accelerating worldwide trend towards restricting NOx, CO2 and particle emissions is reason enough to intensify the search for fuels and technologies that can help meet the challenges ahead. 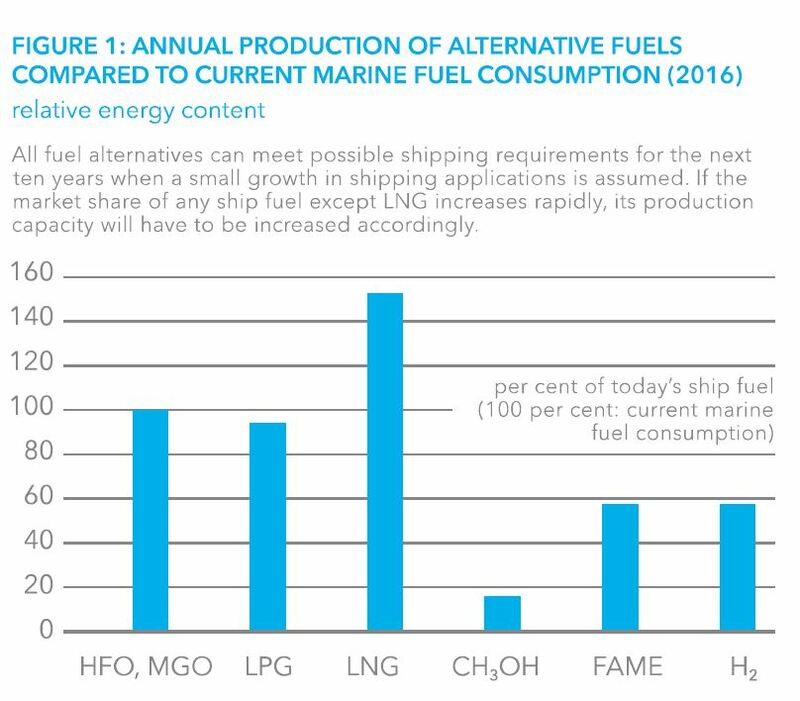 Among the alternative ship fuels being discussed to substitute conventional fuels, DNV GL has identified LNG, LPG, methanol, biofuels and hydrogen as the most promising options. In 2016 the first dual-fuel engine with a low-flashpoint liquid (LFL) fuel system was installed on an ocean-going tanker, using methanol as a fuel. Methanol reduces sulphur emissions (SOx) by about 95 per cent and nitrogen oxide emissions (NOx) by about 30 per cent compared to conventional marine diesel oil. The DNV GL-classed vessels have been assigned the additional notation LFL FUELLED to demonstrate compliance with the DNV GL rules for low-flashpoint liquid fuels (LFL). DNV GL was the first classification society to publish rules covering LFL marine fuels in July 2013, to ensure that the arrangement and installation of these systems have an equivalent integrity level in terms of safety and availability as a conventional system. Methanol today is produced mainly from natural gas but can also be produced by renewable sources, such as biomass, recycled CO2, and hydrogen, or agricultural and timber waste. Its energy content is roughly half that of standard heavy fuel oil, but as it is liquid, methanol can be handled using relatively simple bunkering and storage solutions without having to make extensive modifications. The first LNG-powered Aframax crude oil tankers will be delivered this year. The new Aframax ships will be equipped with low-pressure X-DF dual-fuel engines meeting Tier III requirements in all operational modes. The first four units will be LNG-fuelled or LNG-ready and capable of running either on LNG or on standard marine fuels. The tankers will receive the DNV GL Clean (Design, Tier Ill) class notation. When not running on LNG fuel, selective catalytic reduction (SCR) technology on board will ensure compliance with the Tier Ill regulations governing NOx emissions. As DNV GL’s PERFECt ship concept study has demonstrated, the well-known combined cycle gas and steam turbine technology might be a viable solution for ships in the power range above 30 megawatts once low-sulphur fuels are widely in use. Other new technologies with reasonable potential for application in certain ship types include battery systems, fuel cell systems and wind-assisted propulsion. The biggest hurdles for other alternative ship fuels and propulsion technologies are unrelated to whatever it takes to apply current engine and gas turbine technology. In conjunction with the low-emission fuels named above they are readily available or can be developed without substantial effort. Fuel cell technology in combination with various fuels can achieve efficiencies equal to or better than those of current propulsion systems. 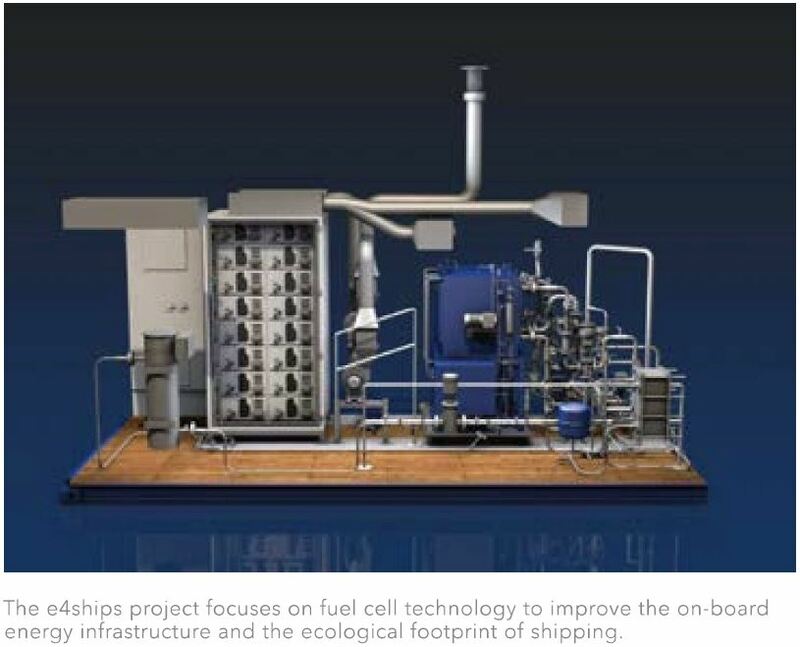 However, fuel cell applications for ships are still in their infancy. The most advanced developments are those related to the DNV GL-supported e4ships lighthouse project in Germany, with Meyer Werft and Thyssen Krupp Marine Systems leading the initiatives for seagoing vessels. Wind-assisted propulsion likewise has a certain potential to reduce fuel consumption, especially on slow ships, but the business case remains challenging. Batteries used for energy storage, while not a primary energy source, have major potential for ships running on short distances, or as supplementary energy sources on board any ship if used to increase the efficiency of the propulsion system. In deep-sea shipping, current battery technology cannot substitute liquid or gaseous fuels. The primary challenges associated with alternative fuels in shipping result from environmental considerations, availability of sufficient fuel quantities, fuel costs, and the rules of the IGF Code. Environmental and price challenges continue to drive the interest in alternative ship fuels, but the number of realistic candidates remains small. After LNG has overcome the hurdles of international legislation, methanol and biofuels will follow suit very soon; the development of rules for LPG and hydrogen within the scope of the IMO IGF Code will take considerably longer. Yet, the foreseeable volume requirements for shipping could in principle be met by all fuel alternatives mentioned above over the coming years. But a major rise in demand would without doubt require massive investments in production capacity, except LNG, which can also be available in higher quantities than the currently forecasted demand (comp. Fig. 1 for production capacities. Note that LNG includes increase in production until 2020). Without government action in the form of tax breaks or subsidies, renewable fuels will find it difficult to compete with the prices of conventional fossil fuels. LNG and LPG are the only fossil fuels capable of achieving a reasonable CO2 reduction in the next five to ten years. “CO2-neutral” shipping seems possible only with fuels produced from renewable sources. If the shipping sector resorts to synthetic fuels produced from hydrogen and CO2 using renewable energy, the available alternatives will be liquefied methane (which is very similar to LNG) and diesel-like fuels.